1 What is spear fishing? 2 What is a pole spear? 3 Why should we have a pole spear? 4 How many types of pole spear are there? 5 How to use a pole spear? 6 How to choose the pole spear? 7 What are the pole spears on the market? Spear fishing has been around for thousands of years beginning with the simple concept of using sharpened sticks to hunt fish while swimming. In the modern era, the sport of spear fishing has become very popular and grown to include the use of specialized spear hunting equipment such as pole spears, spearguns and slings being used while snorkeling, scuba diving or simply swimming. The sport itself is popular around the world although the regulations that govern it vary wildly within different geographical regions. There is no bait or lure used in traditional spear fishing, something that is considered a ‘cheat’ in the sport. A pole spear is a tool used for underwater fishing. It is a relatively simple tool in that it contains three main parts: A pole which can be of varying lengths and made of different materials, a spear tip which can also vary in design and material construction and a rubber loop. The high-quality pole spears are made of carbon fiber and are extremely light. The pole is however strong enough to resist the twisting forces and not bend while being used. The current pole spear manufacturers offer a number of different sizes of pole spears and even allow for some degree of customization in choosing where the elastic band goes, what kind of spear tip to include and the position of the rest. Why should we have a pole spear? Owning a pole spear and experiencing spear fishing is something that is difficult to describe because the actual adrenaline rush that comes from one of the most primal methods of fishing is just on a whole different level altogether. Spear fishing is also a sport where you do not need a ton of equipment or even other people to participate. Once you have a pole spear all you need is a water body to start hunting some fish! In fact, this low investment is one of the reasons why spearfishing as a sport is growing rapidly around the world. The other main reason for the fast growth of this sport is, of course, the entertainment factor that plain and simple diving may not be able to provide after a while. How many types of pole spear are there? There are three basic types of pole spears. – Also called as floppers, these are the traditional pole spears and are easily the most popular one among the enthusiasts. It is easy to see why because it is easy to use and can be stored away very easily. The small diameter of the single tip is excellent for catching fish but sometimes the smaller ones can be a little difficult to get a hold of. If you are however fishing for medium sized fish then this is an excellent option. – These are a little controversial among the spear fishing community. Some people they are excellent for paralyzing or stunning the small fish but that they do not always work on the larger sized fish. On the other hand, the fact that these wider sized three pronged pole spears do not penetrate the fish may actually be a more conservative method of enjoying the sport. Beginners will need a lot of practice before they can use the paralyzers with any sort of expertise. A common thing to remember while using both the single tip and the paralyze is to primarily fish in shallow water or near coral reefs. This will allow you to you use a hard surface to drive your spear into the fish with success. – if you are looking to catch some big fish then this is the pole spear you will want. Slip-tips are used almost exclusively for big game and usually have a sharp or barbed tip for maximum impact. The disadvantage of using a slip-tip is that it has to be rigged before every shot and so can be a little slow in real world situations. The fact that the tip removes from the end actually gives it slightly less penetrative force than a flopper and so a fish is less likely to tear off and get away. How to use a pole spear? A pole spear is not the most complicated tool to use. The elastic is what has to be stretched to provide the momentum and propel the spear. The first trick of using the pole spear is to get up close and personal with the fish. The length of the spear will determine the range and this is why some people prefer to use a longer spear. This can be tempting when you are buying your first pole spear but remember that beginners may have a lot more troubling maneuvering a longer spear. The elastic of the pole spear should be kept in the crook of the thumb and then pulled on back above the spear. The tension will launch the spear in the desired direction when a fish comes within range. When the spear is released, the rubber band must be let go of but the hand continues to guide it to ensure accuracy. Try and get as close to the fish as possible before taking your shot, ideally within five feet. To achieve this you may have to hide behind rocks, try and camouflage yourself or make educated guesses through close observation of the fish swimming patterns. How to choose the pole spear? Okay, so now you have decided to buy a pole spear. How do you choose the best one? This answer will vary for different people but here are some simple things to follow. First, decide on what kind of fish you will be hunting and in what kind of depth will you be using the pole spear. If the answer to the above questions is mainly small to medium sized fish and in shallow waters then you need to decide between a single tip or a trident paralyzer. A single tip is very versatile to use and does not have much a learning curve. It can be a little difficult catching the smaller fish with them in the beginning but once you get the hang of it there is really no restriction on the kind of fish you can catch with it. A paralyze has very little penetrative power and is meant to ‘stun’ the fish long enough for you to finish the job. A beginner might find it difficult to get enough force behind their spears in the beginning, however, the precision required is lesser than for the single tips. We recommend sticking to small fish with the paralyze because the bigger fish will simply wriggle away. If you want to catch some big game then use a slip-tip. This is again something that experienced spearfishers will have an easier time with than the beginners. A slip-tip will actually detach from the spear and stick in the fish so it needs to be secure to the pole spear with an elastic thread. If you miss the fish and hit some rocks then you can damage the spear. Now that the tips are done, move on the length of the pole spear. The most common lengths that a pole spear comes in are five-seven feet. This is what we recommend to stick to especially as a beginner. The smaller pole spears will be easier to carry and much easier to use inside the water. The downside of course if the reduced range but that is something that should not stop you too much in shallow waters. The last thing to consider is the weight of the material. As a rule of thumb, if the fish you are after is less than 20 pounds then use a carbon fiber spear that will be very light to use, have adequate strength and torsional resistance. The lighter weight will allow you to propel the pole spear at a faster speed as well. For big game, we recommend using a fiber glass spear that will be much heavier and as a result a lot more difficult to wield. It will pack a lot more punch though. What are the pole spears on the market? This is easily one of the best choices that you can make while buying a pole spear. The length of the spear is 5ft as described and is made of fiber glass. The cost of the pole spear is extremely reasonable and quite frankly strange considering the finish of the product. The pole spear breaks down into three pieces, two 24 inch pole pieces and a 12 inch paralyze tip. This makes it absolutely perfect for traveling as the entire thing can fit in a briefcase if required. The package ships with a rubber sling that we found to be of high quality as well and an included bag which we found very thoughtful as well. 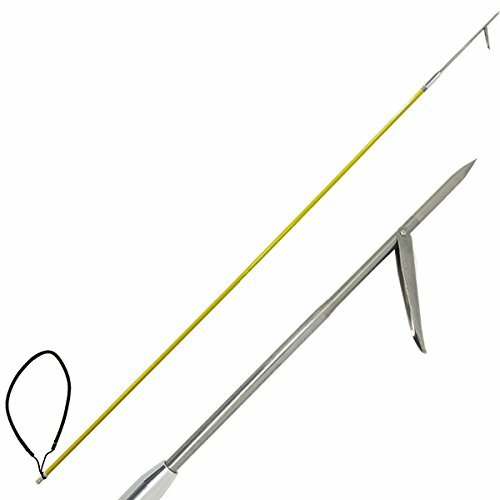 This is an excellent pole spear for a beginner who is targeting small fish like Halibut, White Sea Bass, Yellow tail and other small varieties found in shallow water. If someone were to ask us to name one pole spear to own (and people often do) we would tell them to buy this spear. It is an absolutely brilliantly made traditional single tip pole spear that is quite inexpensive. The length of the pole spear of 7 feet and it does not detach into smaller pieces. This can be an issue while transporting it to different places. The tip is a single barb tip that has excellent penetrative power. The pole spear comes with a flap to help prevent fish from sliding off. Snappers, Groupers, Lionfish, and Cudas are just some of the varieties that you can target with this pole spear. The versatility of this spear makes the choice of prey almost limitless. The pole spear is made from fiber glass and ships with a black rubber sling. This is an extremely potent piece of kit that you can get for not too much more money than the fiber glass spears. The advantages of this spear are that carbon fiber is almost 40% lighter than a similar sized fiber glass pole spear and is more durable to boot. The length of this spear is 7 feet and does not break down into small pieces. It comes with a single prong barb tip that is made of stainless steel. The tips are replaceable if needed although care should be taken to match the treads while doing so. A black rubber sling is included in the package. The penetrative power and length of the pole spear allow it to be used for slightly larger fish like carps, flounders or can be used for the smaller species as well. 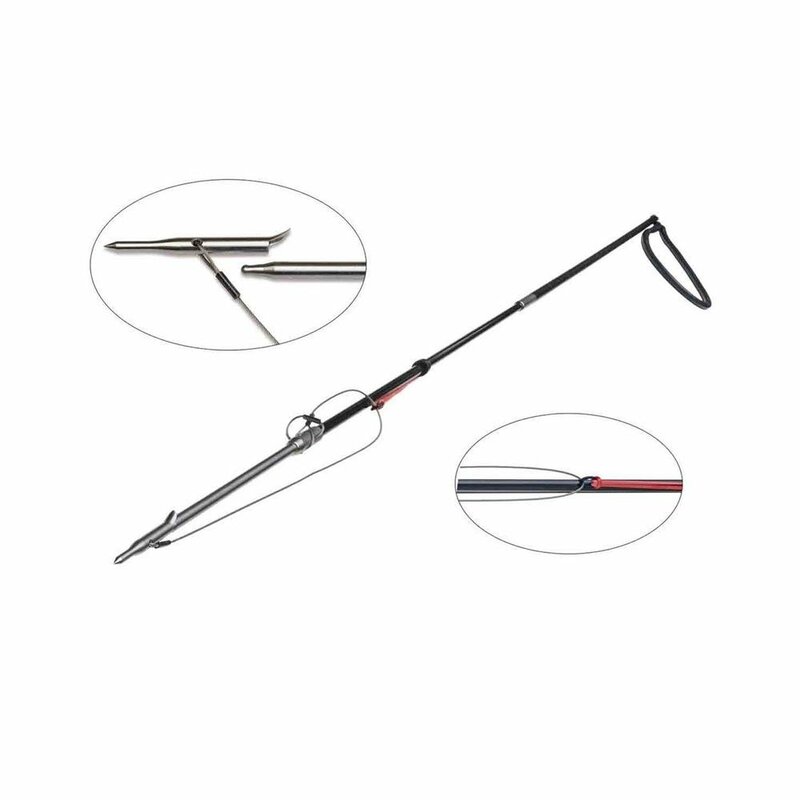 Made by Mako Spearguns, this pole spear is a very high-quality product. It is a three pieced design that breaks down to 27.5 inches that allow it to be stored very easily during travel. The pole spear when assembled completely measures 6 feet and 7 inches. The material of the pole is high strength, corrosion resistant, anodized aluminum, the kind that is used in aircraft construction and is pretty sturdy in real world conditions. A unique feature of this pole spear is that the tip can be used with different pole lengths depending on the kind of fish you are after. 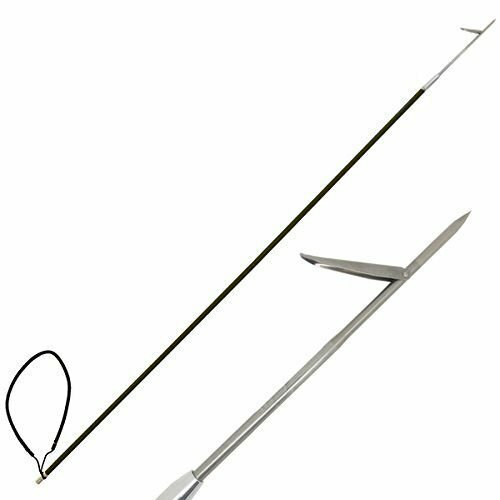 This spear is suitable for Lion fish, carp, white sea bass or just about any medium to small sized fish that you can think of. The manufacturer recommends sticking to 10-15 lbs sized fish with the fully assembled three piece spear. We are not huge fans of the 5 prong paralyzer tip since too many times fish can get hit but wriggle away quite easily but it makes precision a minor concern for beginners. This is a high-end pole spear that has one of the most innovative designs we have seen on the market. It is a two piece spear where the back part of the spear is made of a composite material that is stronger and lighter than aluminum while the front part is made of carbon fiber. The connection between the two halves is through 316 stainless steel connection to ensure that there is next to no chance of a malfunction. The length of the pole is 9 feet and it comes with a slip-tip, an injector rod, a rubber band, a retaining band kit and some stainless steel hardware. The weight of this spear is about 1.6lbs. This spear is ideally used for big game fish like Yellowfish Tuna, Marlin or others depending upon the ecology of the area. Spear fishing is one of the most exhilarating sports that you can take part in. The best part is that it does not require any major investment on equipment on your part. Pole spears may have got unimaginably better than they once were but they remain firmly within the grasp of the vast majority of people. 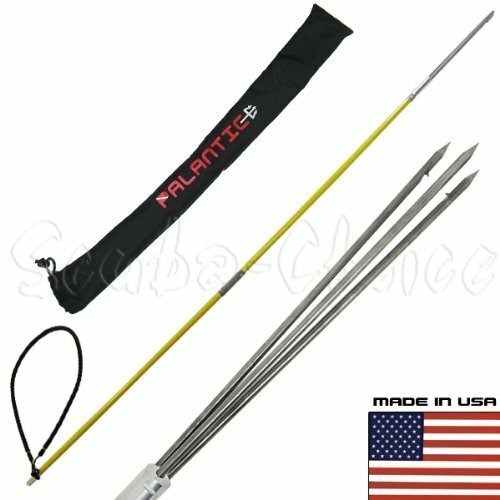 Researching the different kinds of pole spears and then finding out which one suits you best is as much a part of the sport as is actually going spear fishing so head on out to the water and get started!